MEANING OF NAME: Originally called Bibi, by his owner, he has been renamed as “Logan” which is the name after the area he was found and after the ’X-Men’ character who was very brave, something we hope Logan the bear will also be. HISTORY: Logan was found at Lokan River, Kulu-Kulu Village in Sabah. The owner claimed that Logan was left behind when he was following his mother crossing a river. Logan seems tiny and skinny beside his left front paw maggoty and hairless. He kept Logan around three months before surrendering him to the Sabah Wildlife Department (SWD) on 19th of May 2018 who sent him to BSBCC on the same day. Logan weighs 9.15kg. And sadly we found the claws on his front left paw have developed abnormally he was also missing his thumb on the same paw on his arrival. During the health check, X-ray is performed and the X-ray showed his left paw is malformed and loss first phalange thumb. 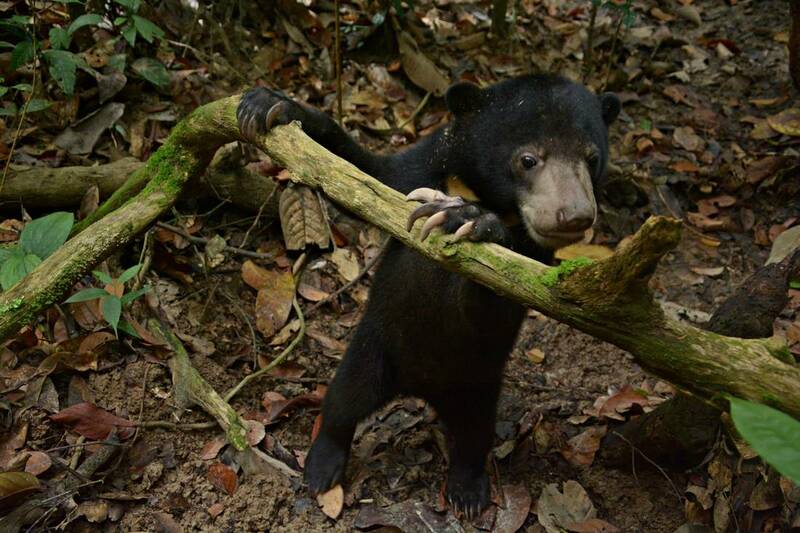 PERSONALITY: He is the youngest male sun bear cub at BSBCC. He has bright and innocent eyes that can capture everyone. In between playing he enjoys resting on the big platform or climbing structure. He loves his towel more than anything. He sniffs, bites, and snuggles with the towel or gunny sack which is like his security blanket. On the 7th of June 2018, little Logan finally stepped out to the forest again! He is a fast learner and is showing great progress with his forest skills. He loves to dig and eats termites, ants, and pill millipedes. Termite mounds are his favourite! Even though he has difficulty in climbing due to his abnormal claw development and the absence of his left thumb, there is nothing that can stop him from climbing up and down, and exploring the environment. Only sometimes he will easily get tired after he tries to climb too many different trees or lianas. Logan also knows the way to the stream and enjoys dipping in it! Logan still has a long way to go. He is still under the stage of development. Under the care of our team, Logan will be given a nutritious diet to make sure he can be raised in good health. We have high hopes that Logan will be the bravest bear that you ever have seen! He will gain the courage and strength that will help him go back to the forest and be wild! ADOPTION: Logan are adopted by Teddy and Taylor Terlizzi through the My Bear Adoption Programme.